The Dalian fisherman, the blogger, sent me a message saying that Dalian fishermen had headed to Beijing group by group on Aug. 31 to make a petition. I can perdict that there would be some fighting between the fishermen and the polices or some hired people. The fishermen would be beat and two or more may be arrested and then could be sentenced to jail for damaging the stability of this “harmonious” society. I copied one picture named 《Audiences》here. Just like this Chinese author said that reading a lot everyday, I often have such feeling … audiences. This entry was posted in Others and tagged Dalian oil spill in China on September 2, 2010 by Mia. After being victoms of the Dalian oil spill, will the fishermen be victims of lies of the local government? According to that fisherman’s blog, in order to clean the oil in the sea, the goverment promised that they would collect the leaked oil with RMB300/barrel. The fishermen rushed to the sea to collect the leaked oil and one fisherman disappeared in that oil-contaminated sea. 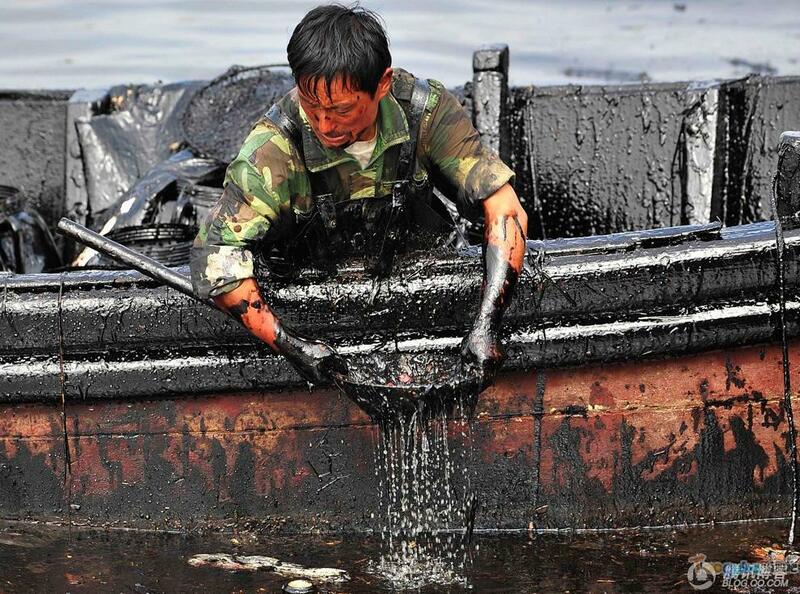 In order to collect the oil quickly, some fishermen used their bare hands. Someone passed out at the site. More than 10 boats dropped during those days. Most of them showed symptoms of poisoning. Soon, the leaked oil were collected from the sea. But, until now, those fishermen haven’t got the payment from the government yet. Today, I received a message from that fishermen saying that it’s Monday today, and the government didn’t keep their words. And some fishermen want to go to Beijing to make a petition, but seems not easy to get out. I think, what he means is that the government blocks them to go to Beijing. Such things are quite common in the main of China for many years. Those people could be taken by polices or some other people on the way, beat and imprisoned in a “black” jail. Sometimes, there are fighting. I remember that one teenager killed a man who seems hired to block them. Some of the people was sentenced to imprisonment or Reeducation through labor because trying to make a petition to higher authorities. I just saw a message and the photo on the Internet forum saying that a peasant who reported against one officer selling the field illegally and then after a talk with the leader of the town, he was dragged to death by a waste truck on the way. Some Chinese people like to blame me that I always like to say the negative side of China, but I can’t close my eyes to my fellows who are suffering. If I keep silence, if every Chinese keep silence, will those people’s situation get better? No. If more people speak it out, the situation may get better because when more people speaks it out, the people who are suffering will know their own situation and will help themselves, and when other people notice it, they may help. That’s the way I love China. I don’t care if those people with power and fluences look good with it. What they should do is to behave. In fact, those people fight for their freedom and rights, also for our freedom and rights. Why we can enjoy such freedom is because some other people had fought for it with their valueable things, even lives. At least, it is so for ordinary Chinese people. Some people said that during that famine in around 1960, in Henan provice, militia guarded the village to prevent the people in the village to go out to beg for food. Those officers took their power, there position, they look good … as a priority over people’s life and always so. Chinese People should realize it and change it. This entry was posted in Others and tagged Dalian oil spill in China on August 31, 2010 by Mia. On the local time July 16, oil pipeline exploded in Dalian, China. Recently a fisherman from Dalian blogged that all the people haven’t got the payment from the government. The government promised that the government would pay RMB300 for a barrel of leaked oil that the people collected from the sea. He also said that during those few days, more than ten boats dropped and one fisherman disappeared in the sea. This dead man didn’t get any “collecting leaked oil” money from the government. Not to mention the compenstation for their loss. In addition, they didn’t know if they could continue their business now since the oil may have contaminated their products. They want the government to give a conclusion soon. According to the reports and the blogger’s blog, this fisherman above and the other fishermen collected the leaked oil but haven’t got payment from the government of Dalian yet, and the government of Dalian had rewarded the reponsible unit RMB500,000. On the micro-blogging site, the blogger told me that they went to the local government to make a petition but got nothing. He seems quite furious. Here I translate some content of his blog into English and hope it can be a little bit help for them. Anyway, if some authorities from China send police to Canada to arrest me for this article, hope that Mr. Stephen Haper can step out to deal with it … … Just kidding. This entry was posted in Others and tagged Dalian oil spill in China on August 23, 2010 by Mia.